See also Habermas's lecture at the Library of Congress, Washington DC, September 29, 2015. 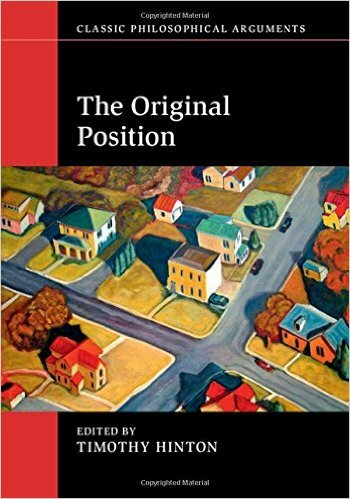 New Book: "The Original Position"
At the centre of John Rawls's political philosophy is one of the most influential thought experiments of the twentieth century: which principles of justice would a group of individuals choose to regulate their society if they were deprived of any information about themselves that might bias their choice? In this collection of new essays, leading political philosophers examine the ramifications and continued relevance of Rawls's idea. Their chapters explore topics including the place of the original position in rational choice theory, the similarities between Rawls's original position and Kant's categorical imperative, the differences between Rawls's model and Scanlon's contractualism, and the role of the original position in the argument between Rawls and other views in political philosophy, including utilitarianism, feminism, and radicalism. This accessible volume will be a valuable resource for undergraduates, as well as advanced students and scholars of philosophy, game theory, economics, and the social and political sciences. Timothy Hinton is Professor of Philosophy at North Carolina State University, Raleigh. (Forthcoming in Cambridge History of Moral Philosophy ed. by Jens Timmermann & Sacha Golob (Cambridge University Press). Discourse ethics in both its generic and specific sense is perhaps best understood by focusing on its most influential formulation, that of Jürgen Habermas, in its revised version in and after Between Facts and Norms. In this work, Habermas continues and transforms the early modern program of “moral philosophy”, leading up to Kant's Metaphysics of Morals and comprising politics, natural law, morality and personal virtue. Habermas's discourse theory attempts to formulate a general account of various complementary normative orders, based on a single discourse principle (D). Practical normativity then is specified along two dimensions, along the lines of the types of reasoning employed (pragmatic, ethical, moral) and along the lines of the practical and institutional contexts in which these processes of reasoning take place (informal, legal, political). Discourse ethics in its core sense is then assigned the study of the moral use of reason in informal, non-coercive contexts of interaction. In what follows, I first delineate how the idea of a discourse theory is introduced in Habermas's Theory of Communicative Action (1). Then turn to the distinction between moral and ethical discourses (2) before commenting on the discourse principle (D) as neutral between various types of normativity (3). I finally turn to its instantiation in a theory of morality, i.e. as a discourse “ethics” in the narrow sense (4). Jonathan White on Habermas's "The Lure of Technocracy"
The Riptide of Technocracy. Can there be a democratic EU? "Habermas consistently emphasizes national institutions as the legitimizing pillar of transnational politics. Repeatedly we are told that nation-state democracy is an achievement that, even if insufficient to the demands of the global economy, must not be sacrificed in the building of a transnational order. Popular hostility for the EU is cast as rightful recognition of this fact: “the fear of a superstate mainly betrays the desire to hold on to the democratic substance guaranteed by one’s own nation-state.” A significant passage in the book is devoted to a constitutional thought-experiment intended to clarify the proper balance between national and supranational sources of authority. With the concept of a “double sovereign,” he evokes a compound image of the EU in which the national and the supranational are mutually supporting. (......)"
"For Habermas and the wider Frankfurt School, political philosophy is not about imagining a better world from first principles: it must always proceed from the ideas and practices of the existing order. Rather than reflect on abstract ideals, it must look for the logic that is already present, however imperfectly, in existing institutions and explore how they may be reformed to better express it. It is a deliberately non-utopian approach and reflects a conscious rejection of grand theorizing. Indeed, for all the skepticism of Streeck and others, it may signal too great a concession to realism."